Proprioception. Besides a big word that your doctor or therapist confused you with, what exactly is it? Some people refer to it as balance, others say it is joint position sense. In truth, it is a little bit of both. Lets look a little closer at this very important concept, and why you need to work on improving it after a sports injury. Proprioception, in a nutshell, is the way that your body communicates with itself. To be able to walk, run, jump, and play sports, all of the different parts of your body have to be able to talk to one another. The joints give feedback to the muscles, and the muscles react to what the joints tell them. The better the communication, the easier it is for all the parts to do their jobs, and to do them well. Proprioception is a combination of balance, joint position sense, and body awareness. It is vital to sports performance and rehabilitation following injury. Within the joints of the body, there are ligaments and joint capsules that hold the bones together. Within the ligaments are very small cells called proprioceptors. The job of these cells is to communicate with the rest of the body what is going on in the ligaments and within the joint. The proprioceptors tell the central nervous system, or your brain, what position the joint is in, and also if the joint is moving or not. If you were to close your eyes, and then have someone bend your elbow for you, you would know that your elbow was being bent, and how much, because of the feedback the proprioceptors are giving your brain. This is what I mean when I say joint position sense. Try balancing on one foot for 30 seconds. As you do this, notice what your ankle does. It shifts back and forth, and your foot rolls in and out. You don't actually think about creating these movements, your body just does it to keep you balanced. What is actually happening inside your ankle and foot is very precise communication between the proprioceptors in all of the joints and all of the muscles in your foot and leg. 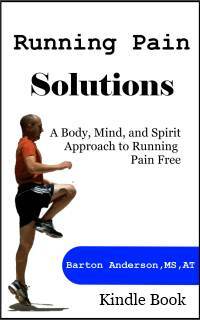 The proprioceptors tell your muscles when to contract and when to relax to keep you balanced. The same thing applies to sports activities. When you are shooting baskets, or passing the soccer ball, your body's joints are constantly communicating with the muscles, telling them when to contract, when to relax, keeping your body stable and efficient. With an injury, there comes a certain amount of tissue damage. Within the tissues, whether it is a ligament, muscle, or tendon, there is damage to the proprioceptors, and a disruption of the communication between the different parts of the body. When this occurs, the muscles cannot react as fast to keep your knee, or ankle, or shoulder stable. They cannot do their jobs efficiently. So, your performance decreases, or even worse, you are more susceptible to injury. This is often a major factor in re-injury in sports and in daily life. Once you are injured, your proprioception is diminished, and so you are more likely to have problems, or to re-injure yourself. Proprioception dysfunction can be severe, or it may be minor. Either way, the muscles efficiency is compromised, and so you are not at your best. The most common way to improve your proprioception is to work on improving your balance. Sometimes this is as simple as balancing on one foot. As you balance, your joints begin to communicate with each other, and improve the function of the muscles. Add to that balancing challenges that make it harder, like standing on unstable surfaces, or moving your arms or legs around, and the body is forced to adapt to the challenges and improve its communciation. Every good rehabilitation program involves some type of proprioceptive training. It can be balancing, or it can simply be exercises that require your joints and muscles to communicate with each other better. As you do more exercises, your body adapts and your proprioception gets better. Think about an injury that doesn't have any rehab, just rest. There is no improvement in the communication of the muscles and joints because you have not challenged the body to adapt. When you return to sports, everything is working at a lower level. That leads to re-injury. Just like doing exercises to increase your strength, you have to do exercises to increase your proprioception too. That is one major key to sports injury rehab, and getting yourself off the sidelines.